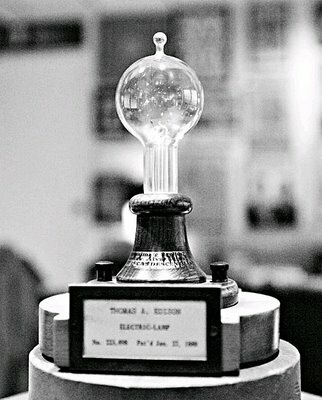 Thomas Edison's first electric light bulb, 1879. Thomas Edison gets credit for inventing the light bulb, and it’s entirely fair to say he deserves it. Still, just because his is the first name in electric light doesn’t mean he has the final say in electricity. Edison would have you think so. Like most great inventions, the light bulb wasn’t the work of one person, but rather the result of the combined efforts of many. Since Italian monk Giuseppe Ponzelli first theorized that electric light was possible in 1747, many others worked on inventing the light bulb. It took a while, though. The first commercially viable light bulb was invented by Edison in 1878. His next effort would have to be to invent a place to plug it in! Well, not really. In fact, Edison figured he had that all sorted out. Light bulbs, he posited, would draw from a direct current of electricity. Edison worked on other electrical inventions at his Menlo Park, New Jersey lab, and the direct current worked just fine for him. It kept a constant supply of electricity going, so he already had a place to plug any of his inventions in. The system of sockets and outlets we use today would be developed soon enough. Soon after its invention, Edison gave a very public display of his electric lights one night, and became a sensation. This was the guy to go to if you wanted to work in electricity, and scientists and engineers flocked to Menlo Park to see if they could work in the shadow of Edison—now that he was able to cast a shadow even at night. One applicant for work at Edison’s lab was a brilliant young Serbian named Nikola Tesla. Tesla came to America with no job but with great talent and a brilliant mind, so of course he wound up fighting with his boss and got fired. The issue was electrical currents. Tesla didn’t think Edison’s direct current (DC) was the best way to use electricity, favoring what’s called alternating current (AC) instead. Edison, who didn’t care for young upstarts telling him how to run his business, kicked Tesla to the curb. The difference between AC and DC is simple, but important. A direct current is a constant, steady electrical charge moving through a wire or some other kind of conductor. An alternating current is a series of small electrical pulses being sent along the same conductor. The advantage, as Tesla saw it, was that AC would let you send electricity over greater distances, without having to maintain the constant charge of a direct current. Basically, AC was a lot more efficient than DC, and would be much more useful for a potential network of electrical power, which was something Edison would need if he was going to sell many of his inventions. Tesla didn’t have trouble finding work. He made his way to a firm run by a rival inventor and engineer, George Westinghouse. Westinghouse agreed with Tesla about AC, and was glad to employ him. Within a decade, it was obvious that AC was the future, and the power grids that we use today were under construction. Edison was bitter about it, and continued to promote DC, regardless. He talked about AC as dangerous, suggesting that it was much more likely to kill you than DC. To prove this, he gave public displays of electrocuting animals with AC. He was losing money because of his obstinance, and the electrocution shows he gave were also costing him in the war for public opinion. His most famous electrocution show turned out to be one that Edison himself didn’t even orchestrate. This was the execution of Topsy the circus elephant. Topsy, an Asian elephant who had already trampled three circus spectators, was declared a “bad” elephant, and was sentenced to death. On January 4, 1903, a crowd of special guests and members of the press were invited to kill Topsy. (The original plan was to open the event to the public and charge admission.) Topsy was to be hanged and poisoned, and an electrified platform was set up, just to make sure they finished her off. The show was filmed (using the camera Edison invented in 1895) by the Edison Manufacturing movie company. The film was sold to kinetoscope maufacturers under the title Executing an Elephant. It lasted a little more than a minute. The whole run of the film showed Topsy walking onto the electrified platform and then falling over after being electrocuted. The film was forgotten not long after. Topsy the elephant, right before Edison’s famous display. Edison also tried to tie Westinghouse to pain, crime and death by promoting the fact that the newly invented electric chair (not one of Edison’s inventions) used AC to kill people. Edison tried to promote the use of “to westinghouse” as a synonym of “to electrocute a criminal”. The new term never caught on (though the electric chair did). In the end, AC did win out, and most anything electric we use today runs on it. Power lines carry AC electricity all over the place, moving pulses of electricity through little gray boxes called transformers, which keep the charge going over longer distances than DC possibly could. DC is not without its uses, though. Subway systems run on a direct current. That’s what the famous “third rail” of a subway system uses. Since subways are electric, the trains run by staying in contact with the third rail, so maintaining a constant charge in them makes more sense than the electrical pulses that most devices use. Touching the DC rail and getting a direct current coursing through your body is no more or less fatal than touching a live wire carrying an AC current would be, no matter what Thomas Edison would have you believe.